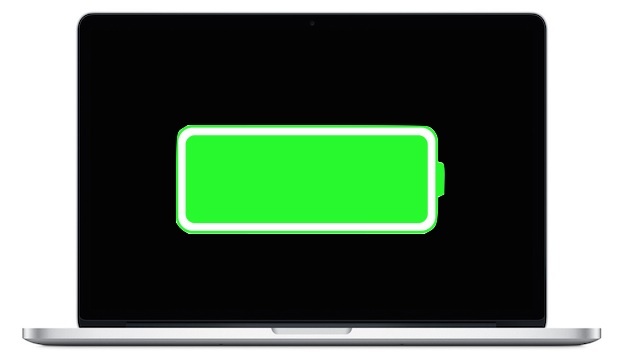 Macs have pretty amazing battery life to begin with, but following a few simple tips will help you to get the absolute best battery performance out of a MacBook, MacBook Air, or MacBook Pro. The primary goal here is to reduce overall power consumption on the Mac laptop and we’ll cover a few different techniques to do this. For casual Mac users simply reducing screen brightness is typically more than adequate to get great battery life, so the tips below are intended for true road warriors who demand the absolute best battery life possible out of their portable Macs. The simplest tip can save some of the most battery life. Reducing screen brightness to 50% or less provides a massive boost to battery life. On most newer Mac keyboards, the F1 and F2 keys allow for brightness adjustment, aim for the lowest value you can tolerate for maximum battery life. Both searching for available Bluetooth devices or broadcasting a Bluetooth signal can drain battery, disable Bluetooth if you don’t use it. Open System Preferences and click on “Bluetooth”, uncheck “On”. If you’re doing something that doesn’t require internet use, turn off wireless networking and you can pick up a nice boost to battery life. The easiest way to do this is to click on the Wi-Fi menu and choose “Turn Wi-Fi Off”. For MacBook and MacBook Pro users with a SuperDrive, eject any disks to prevent needless access and drive spinning. FaceTime, Skype, Google Hangouts, and Photo Booth are a ton of fun, but the front-facing iSight/FaceTime camera is a major battery hog. Avoid using anything that taps into the Macs front facing camera and you’ll avoid major battery drain. Leaving unused apps open in the background use both RAM and CPU cycles, both of which cause power usage and directly impact battery life. Quit any applications that are not actively in use, and try to keep running apps to a minimum to prevent any usage of Virtual Memory. Even inactive web pages can use a lot of system resources by running complex scripts, ads, videos, or other page elements. Remember to close unused browser tabs and windows and you’ll avoid draining battery unnecessarily. Use the battery indicator menu to show you remaining battery life, this helps to give you battery feedback on settings and usage habits, plus you won’t be caught off guard if you’re suddenly at the tail end of battery drain. If you enjoyed this, don’t miss our tips to get the best battery life with an iPad or some more general tricks to maximize battery life on iOS devices, including iPhone. 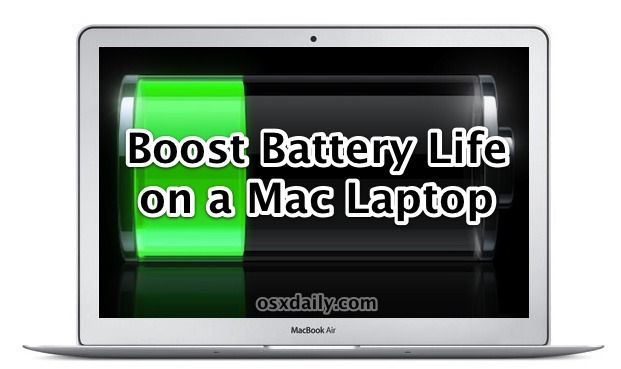 Have any other battery saving tips for MacBook Pro, MacBook Air, and MacBook? Let us know your battery life tricks in the comments! How Long Does Your MacBook Pro Battery Last? I set my brightness to about 40% and don’t change my work habits at all, easily pulls 6-7 hours out of my MacBook Pro. Another “tip” you might want to add is upgrading to an SSD, they use less power than traditional hard disks. Handy app called GFXcardStatus that will let you monitor and disable that. As an added bonus, the machine runs cooler – something very appreciated as those of us in the northern hemisphere are approaching Summertime. Came here to mention that app. This more than anything else helps with battery life. I notice some apps I run frequently like VMWare, Steam, and CoRD all require the discrete card, and after disconnecting lets say a remote session I may forget to shut off the app. I then wonder why my battery is draining so quickly. Bonus Tip #3: You might as well just shutdown your Mac then! For certain MacBook Pro models using the graphics card switcher app can help because then you can push the lower power graphics card into effect. Battery life is great on a MacBook Air, no tips needed for me. Aside from Youtube, which are other popular flash websites to avoid when trying to make the battery last? I tried the plugins from the last tips but they didn’t work well and I didn’t like them. will this work on other devices besides macbook pro ?? I would imagine things like controlling screen brightness and controlling when flash and plugins load would help any computer PC or Mac. I use these tips on a late 2013 13″ rMBP. According to my iStats, I get something like 14 hours out of it.